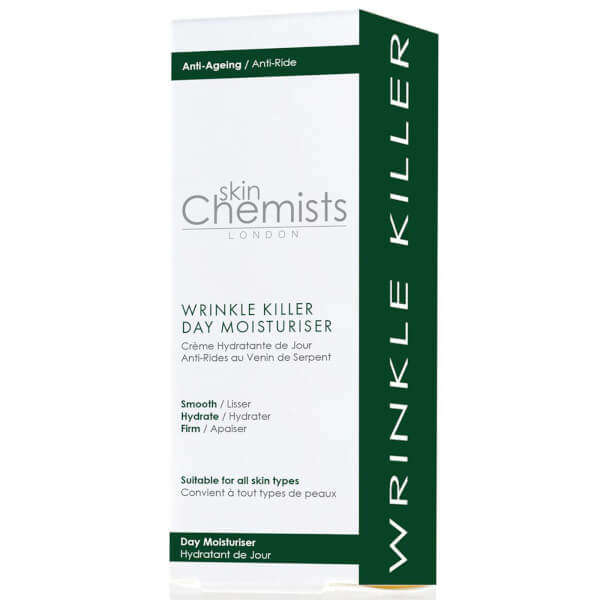 Promote smooth, youthful-looking skin with skinChemists London Anti-Ageing Wrinkle Killer Day Moisturiser, a lightweight day cream that targets signs of ageing to leave skin with a smoother, hydrated appearance. 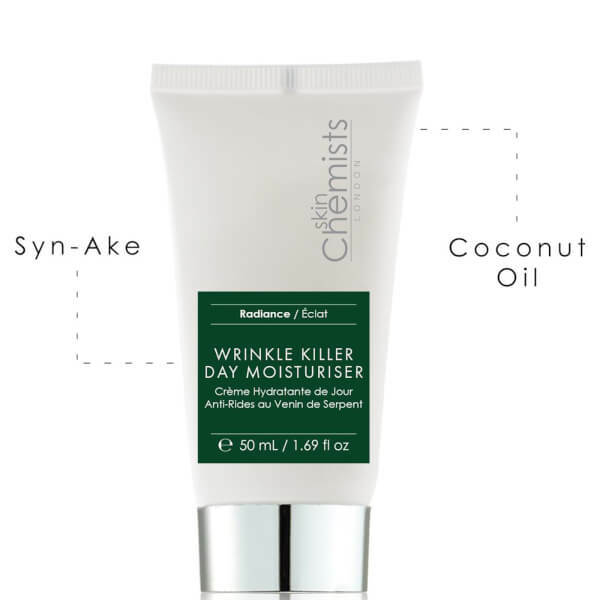 The formula contains Coconut Oil to moisturise, and Syn-Ake, an award-winning ingredient that mimics the effects of a peptide found in temple viper venom to help reduce the look of wrinkles and laughter lines. 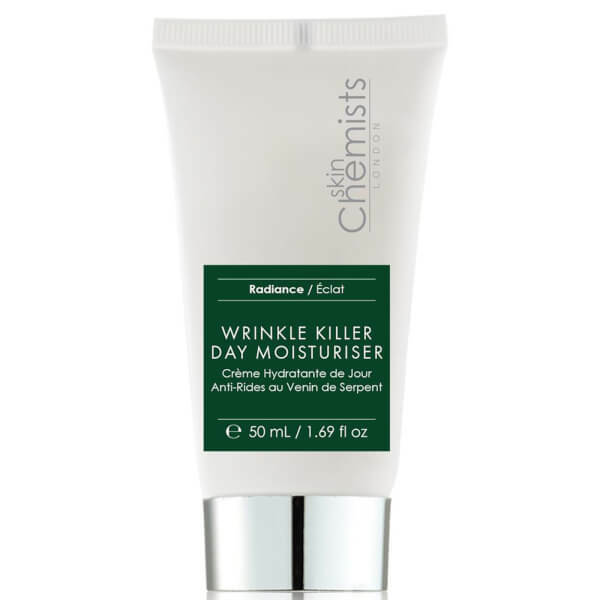 Refining the appearance of pores, fine lines and wrinkles, the antioxidant-rich moisturiser will protect against external aggressors whilst retaining moisture. 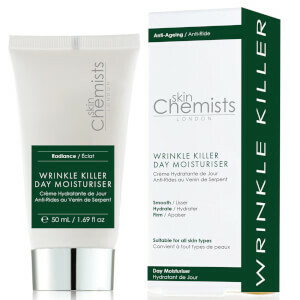 Skin looks smoother and hydrated with renewed vitality. Aqua (Water), Glycerin, Glyceryl Stearate SE, Cetearyl Alcohol, Stearic Acid, Cocos Nucifera (Coconut) Oil, Isoceteth-20, Cyclopentasiloxane, Polysilicone-11, Dipeptide Diaminobutyroyl Benzylamide Diacetate, Phenoxyethanol, Benzyl Alcohol, Ethylhexylglycerin, Carbomer, Xylitylglucosides, Dimethicone, Anyhydroxylitol, Xylitol, Disodium EDTA, Dehydroacetic Acid, Parfum (Fragrance), Gardenia Tahitensis (Tiare) Flower Extract, Benzyl Salicylate, Hexyl Cinnamal, Limonene.